The British Lionhearts produced a triumphant performance in the team’s first home match of the season in the World Series of Boxing (WSB) last night to demolish the Mexico Guerrero 5-0 at York Hall. The victory maintains the Lionhearts unbeaten record in the 2016 season of WSB and cements the team’s place at the top of Group B. A superb performance from light-welterweight, Pat McCormack, and a first round stoppage by local man, Lawrence Okolie, were the highlights of a fantastic night for the Lionhearts that was enjoyed by a packed house at York Hall. The evening began with a win for WSB debutant, Galal Yafai, who was beginning to find the measure of 2014 Pan-American gold medallist, Joselito Velasquez, when the Mexican dislocated his shoulder in the second round whilst throwing a right hand. The injury saw the light-flyweight bout awarded to Yafai. Next up for the Lionhearts was Qais Ashfaq, who delivered a trademark performance of fast hands and clever footwork to outwit Mexico’s Sergio Chirino and take the bantamweight contest unanimously. 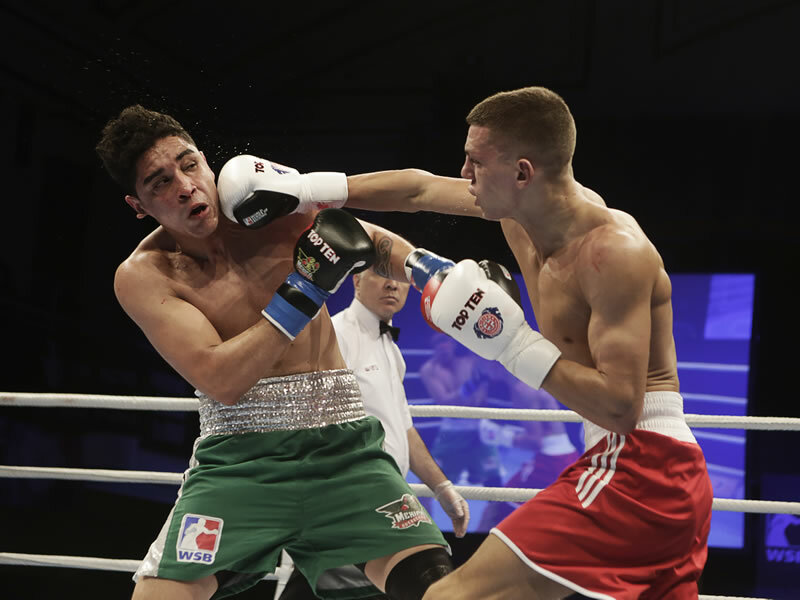 The light-welterweight contest produced a superb bout as 2015 European Championship silver medallist, Pat McCormack, took-on Mexico’s Raul Curiel who has already qualified for the Rio Olympics by virtue of his performance in the 2015 season of WSB. Undeterred by Curiel’s superb record in the competition, McCormack asserted himself on the Mexican boxer and showed his full range of skills to secure a unanimous victory. It was an impressive performance by the Birtley ABC boxer, in only his second appearance in WSB, and gave the Lionhearts an unassailable 3-0 lead on the night and maintained the team’s 100 per cent record for the season. The middleweight bout saw Antony Fowler renew his rivalry with Misael Rodriguez of the Guerreros in a replay of last season’s contest. An attritional bout saw Fowler use his power and fast jab to produce the better work and do enough to earn a unanimous victory on all the judges’ scorecard and set-up a whitewash for the Lionhearts. It was duly delivered within one minute of the heavyweight contest when a right-hand from Hackney’s Lawrence Okolie sent Mexico’s Jared Barraza to the canvas to the delight of the home crowd. The victory was Okolie’s second win in two WSB outings and ensured the Lionheart’s secured the team’s first ever 5-0 win in three seasons in the competition. A replay of the match can be watched on BoxNation (Sky 437/490HD, Virgin 525, Freeview 255, TalkTalk 415) at 3.30pm on Saturday 20 February and 2.00pm on Sunday 21 February 2016. The next home match for the Lionhearts will be against the USA Knockouts on Thursday 3 March 2016 at York Hall in London (doors at 6.45pm, boxing from 8.00pm). Tickets for this match and all of the British Lionhearts home fixtures are on sale now at http://tickets.sky.com/Boxing/World-Series-of-Boxing. More details on the Lionhearts and WSB are available at http://www.worldseriesboxing.com/ and by following the Lionhearts on twitter at @Brit_Lionhearts. BoxNation is available on Sky 437/490HD, Virgin 525, Freeview 255, TalkTalk 415. Subscribe at www.boxnation.com or watch online at watch.boxnation.com and via iPhone, iPad or Android and Amazon devices. GB Boxing was established in October 2008 to manage the World Class Performance Programme (WCPP) for boxing and prepare and train the boxers that compete for Great Britain at the Olympic Games.